Has any one printed a board with a lot of hatched planes? I just started one and my print time is about an hour and a half, the V1 is just printing quick short lines. I am using the recommended line thickness and spacing from the user guide. Its not really a problem I was just wondering what others have experienced with printing hatched planes. Apparently the V1 also likes to take a break when the timer resets, I kept thinking it was freezing so I would kill the software and restart the board after trying to make adjustments for a faster print. The second time it froze, I clicked the home button and it responded. I then took the board out and wiped it back off, but when I came back the the head started moving on its own back to where it came from and started printing again. Sounds like at least 3 bugs here, thanks for reporting them. The freeze-and-dispense-later behaviour is the most concerning. Can you post your gerbers or send them in a support package. That should allow me to reproduce these issues and confirm that any fixes i implement will help. I don't think the printer froze after the timer reset my third time trying, ill send the gerbers though. Would you like the final one I used or would you like me to shift back a couple changes and send those gerbers? I wouldn't have the exact set I printed unless the V1 is storing temp copies somewhere but I don't mind trying to undo some of my fixes for a faster print. Basically I brought in the edges of the planes to as small as possible to make the necessary connections and then made the squares .8mm up from .5mm. the final print ended up being something like 12 + 99minutes. I cant remember the exact numbers. I could also give you the raw design files and you could play with the settings but they're OrCAD. The design should work in the free version of OrCAD though. Let me know what works best for you. I'd like all of them if you don't mind, but I can get by with just the final gerbers if you don't have time to revert your changes right now. As you can see, each individual trace in the hatch plane is composed of two 'passes', and the borders are 3. The V-One software will split traces any time two features larger than one pass each overlap - this is done to prevent ink wastage and prevent pooling when two large traces (or a pad and a large trace, or a pad with thermals) overlap in the design. In most designs, trace splitting will reduce the total print time - unfortunately, in this case, it does the opposite, due to the unintended consequence of producing a ton of small lines. Small lines take up the most time when printing, which is a bit counterintuitive - suffice to say that most of the time in a print is actually terminating, raising and moving between features, rather than printing. Luckily, you can drastically reduce the print time for this case with a few tweaks on either the design side or on the V-One software side. Both approaches reduce the hatch plane so that it is composed only of single-pass traces. First, highlight and print everything except the hatch planes. This should take only a few minutes. Once the print completes, open the settings window by clicking the gear icon in the top right corner of the app. From here, have a look at the 'Pass Spacing' parameter in the Conductive ink column. This setting adjusts the minimum distance between two adjacent 'passes' that make up a feature - for example, if you have a trace that is 0.4mm wide, and pass spacing is set to 0.18mm (the default), your trace can fit 2 passes. 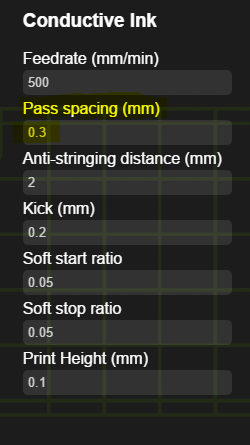 However, if pass spacing is set to 0.3mm, you'll only get one. 4. Increase the pass spacing until all the hatch lines are single-pass traces. For this case, I found that 0.3mm worked just fine (see below). When you save settings, the preview will reload - it should only take a few seconds. 5. All that's left is to selectively print the hatch plane. With these settings, the entire hatch takes 21 minutes to complete. Design Adjustment: If you can edit your design, this is the way to go. All you need to do is to reduce the trace width of the hatch. Your CAD tool should list this as an adjustable parameter. You want to reduce the hatch width so that it is less than 0.36mm / 14mil (aka less than 2 times the default pass spacing (0.18mm). This way, the majority of the traces in the hatch won't be subject to trace splitting, which will drastically reduce print time. Note: Both of these approaches will also reduce the density of conductor within a certain area, since there are now less passes. If you need a denser hatch, you can reduce the spacing parameter of the hatch - as long as your trace widths are low, this should still go much faster than what you started with. Hopefully, these guidelines will be helpful for future designs. If you have any questions, just let me know. Awesome, its easy enough for me to adjust all these parameters on my side. Just so you know, the original numbers I was using came from this guide you guys provide. What if say the vertical lines are double pass but the horizontal lines are single pass? would they cross then? Thanks for letting me know, I've updated the design guide with the current recommendation. We lowered the default pass spacing from 0.2 to 0.18mm a few months ago, looks like we missed updating this part of the user guide. The software will only apply the trace splitting when both intersecting features consist of more than one pass. So if you have a 2+ pass trace intersecting a 1-pass trace, no splitting occurs. Update: Correction to the above statement - the software will split traces if any of the involved traces are larger than two passes.